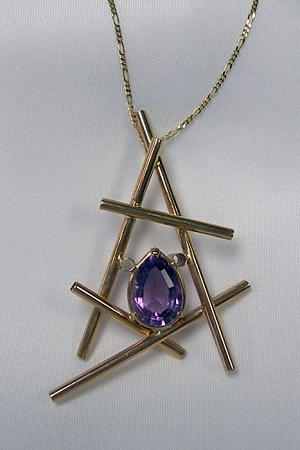 Linear Jewelry - This is a dramatic, yet delicate handcrafted 14K yellow gold pendant that beautifully frames a purple pear shaped Amethyst, which is February Birthstone. This attractive pendant does not come with a chain. One-of-a-Kind Necklace. Handcrafted 14K yellow gold necklace from our "Linear Collection" created from gold tubing. This unique design frames a natural pear shaped faceted Amethyst, February's Birthstone, set in a handmade 4-prong setting. This beautiful pendant is shown with an 18" 14K yellow gold figaro chain. This necklace is an artistic work of art and is signed and created by Aaron Rubinstein and Modern Art Jewelry.